I found Brownlow great. I needed the direction and how to bring it all together. They took into consideration they way we live and our tastes. Thank you so much Sari, it has indeed been a pleasure to work with you! 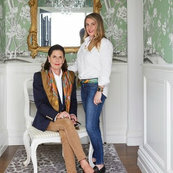 Alexandra & Barb have turned our house into an elegant home that's easy to live in. Thank you for taking the time to leave such kind words, we have enjoyed every minute assisting you achieve the look & feel you are so delighted with.